Former Missouri defensive end Michael Sam at the 2014 NFL Scouting Combine in Indianapolis. Former Missouri defensive end Michael Sam, who in February announced that he was gay, may not be among the 256 men chosen in this year’s NFL draft, which begins Thursday. In fact, based on a historical assessment of players who were rated similarly by media scouting projections, Sam’s chances of being drafted are only about 50-50. Sam, the 2013 SEC Co-Defensive Player of the Year, is rated as a sixth-round pick on the Scouts Inc. draft board, which is available through ESPN Insider. That might seem to imply that he’s likely to be drafted, because the NFL draft has seven rounds. But players projected to be chosen late in the draft are hard to differentiate from one another. You can think of NFL prospects as representing the tail end of a bell curve. At the extreme end of the tail are a small number of potential franchise talents, such as Andrew Luck and Bo Jackson. The curve gets denser and denser with players the farther down the draft board you go, however. 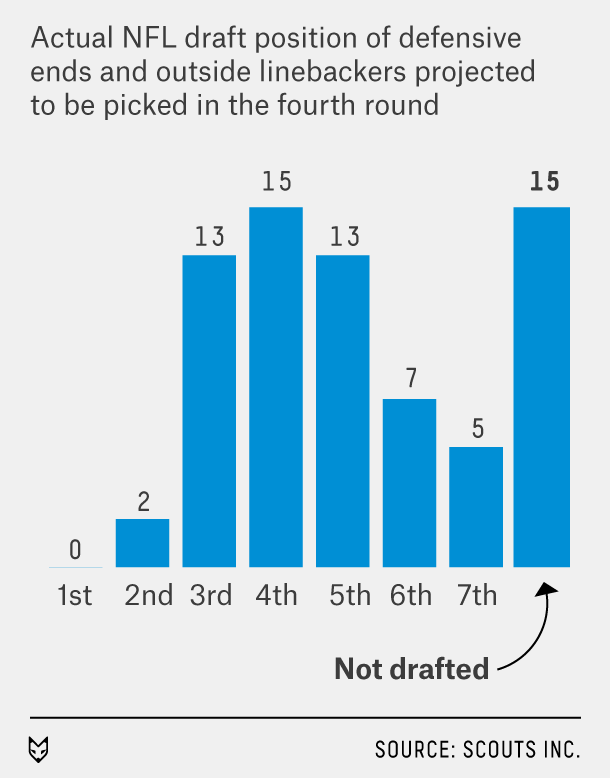 Players who are projected as sixth-round picks often fall out of the draft entirely. There were 67 such players between 2005 and 2013. Of those, 37 players — 55 percent — were not drafted. Twenty-four others were drafted between the fifth and seventh rounds, while six were chosen in the fourth round or higher. Only about 10 percent were chosen in the sixth round exactly. Isn’t it a bit contradictory to describe prospects as sixth-round draft picks when they’re far more likely not to be drafted than to be chosen in the that round? There are more projected sixth-round picks than sixth-round slots. This year, for example, Scouts Inc. lists 71 players as sixth-round picks, but there are only 39 selections in that round (this includes a number of compensatory picks given to teams who lost free agents). The alternative, however, would imply a false precision in differentiating between sixth-round picks, seventh-round picks, guys just off the draft board and so forth. Picks late in the draft are intrinsically hard to project, because each team has different assessments of the players, and some teams prioritize need while others look for talent. But leave these semantics aside. There’s a more pressing issue in the case of Sam. Has his draft status been harmed by his public declaration of his sexuality? Sam’s ranking has fallen on some news media draft boards, including the one prepared by ESPN and Scouts Inc., since he came out as gay. Determining the cause and effect is harder. On the one hand, Sam got middling reviews at the NFL Scouting Combine in February. On the other hand, some NFL scouts and general managers have told members of the media that they’re worried Sam could be a “distraction.” In a league that has employed the likes of Aaron Hernandez, that could be cover for homophobia. But suppose that Sam were projected as a fourth-round pick, which is how he was often described at the time he came out. Would he be assured of being drafted? Not quite. Among the 70 defensive ends and outside linebackers projected by Scouts Inc. as fourth-round picks since 2005, 15 — 21 percent — weren’t drafted. Others were chosen as high as the second round. Personally, however, if the odds are something like 50-50 on Sam being drafted, I think I’d take his side of the bet. Why? A player only needs one team to draft him. A player like Sam who generates polarized opinions might have a better chance of being chosen in a late round by a team like the New England Patriots or the Seattle Seahawks than one who everyone agrees is mediocre.